Social care funding – what am I entitled to? Many of us will need some form of care and support as we get older, and care funding can be a really worry. You may need care and support due to frailty in older age, a disability or a long-term health problem, making some day-to-day tasks more difficult and requiring assistance. This could be receiving care at home through a personal carer or moving into residential care. However, receiving the right care and support can help you to remain more independent and leading a fulfilling and satisfying life. You may have heard a lot about the social care system in the media, in particular with regards to social care funding. The social care system can appear quite complex and difficult to access, but we believe it’s important to understand how it works and what you are entitled to. Getting started with finding the right social care service is the first step. Many people believe that this is the responsibility of the council or local authority, however it is not quite this simple. Your local authority will have a Social Services department with certain responsibilities to ensure that its residents can access the care and support they need and make sure that they receive it. You can use our Postcode Checker to find out who is responsible for social care in your area, as well as their contact details. The relevant Social Services department is required to assess anyone who asks them to evaluate their care and support needs. It then should ensure these needs are met in an appropriate manner. The assessment will determine first what a person’s care needs are and if they are ‘sufficiently serious’ to require council-provided help. They will also use a means test of affordability to assess whether they are entitled to any funding for social care. If an individual does not qualify for care funding, they will have to contribute towards some or all of their care and support requirements. Do you have an eligible need? Councils or local authorities used to use a national set of criteria to determine whether a person’s care needs were ‘sufficiently serious’. The level of need in which a council or local authority was required to act and provide care and support was then set out by each individual area. This meant that that someone with a specific need may have got their care and support arranged by their local council or local authority in one area, but not another. However, in April 2015, the Care Act was implemented, this sets out national rules for determining who is eligible for care and support. This means that, in theory, all local authorities are offering support to the people with the same levels of need. Obviously everything is still open to interpretation and it is still down the the local authority (or an organisation that they use to carry out care needs assessments) to determine whether someone has an eligible need. The first step is to get in touch with the appropriate department of your local authority responsible for social care and arrange an assessment to determine what help they are required to give you. Will I have to contribute to my social care funding? 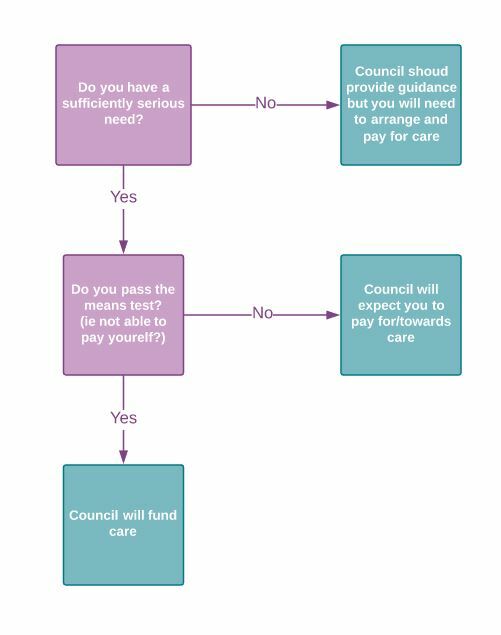 In most cases, where a sufficiently serious care need has been identified, the council or local authority will have to then run a means test, which is a way of identifying how much a person has to contribute towards their own care, even if it is being provided by the council themselves. Not everyone will be entitled to fully funded care, and with cuts in social care funding, it is increasingly likely that people will have to arrange and/or pay for their own care and support. You can find out whether you are likely to have to contribute towards the cost of your care and support using our Funding Checker tool. If the council assessment does not find you have a sufficiently serious need to warrant council-provided care, it doesn’t mean they think you don’t need a level of care and support; just that it doesn’t meet their own criteria. They are still a source of advice and information to help you access the care that you need, though you will have to entirely fund it yourself. 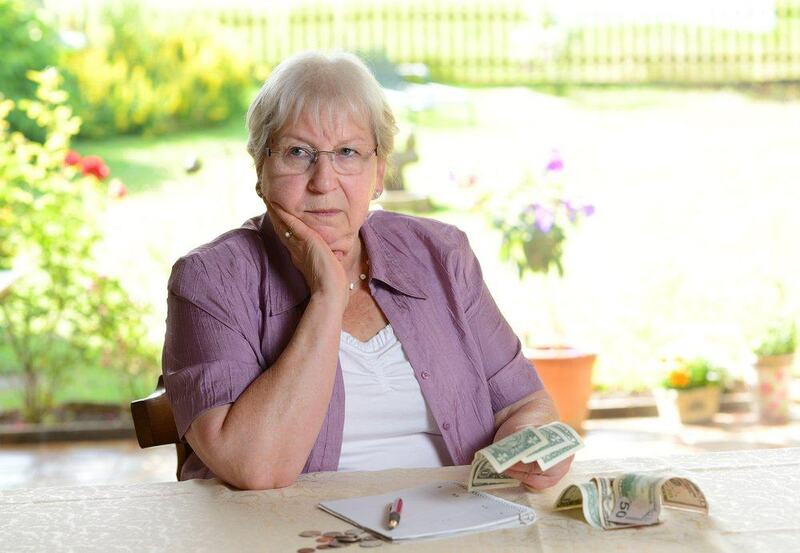 They can even help you arrange the care and support – but they are then entitled to charge you a fee for doing so. Those who do qualify for some funding for social care will receive this in the form of a Personal Budget. This is an individual amount of money allocated directly to you to pay for your care and support. The Personal Budget should give you the choice on what services you wish to receive, as long as they are relevant to your personal care plan. Whether you get a Personal Budget or have to fund care yourself, there are plenty of options out there to ensure that you get the care and support services that are right for you.